Over the last few months, I’ve been working with Tracey and Chris on supporting a few initiatives in partnership with the Ontario Ministry of Health and Long Term Care (MOHLTC). We began by running usability sessions to evaluate personal protective equipment (PPE) at three of the major hospitals in Toronto (UHN, SickKids, Sunnybrook). PPE is any technology, usually clothing and gear, that creates a barrier between the wearer and patient/environment, so basically everything from everyday nitrile gloves to one-piece suits. Personal protective equipment is worn where the risk of injury or infection is of concern, such as managing a patient with Ebola Virus Disease (EVD). When selecting PPE, the right balance between wearer safety, comfort and potential for contamination while doffing (removing the equipment) must be found. Our evaluations helped the hospitals and the MOHLTC gain a better understanding of what works and what poses a higher threat to our healthcare workers. In addition to the usability evaluations, the MOHLTC in partnership with Sunnybrook Health Sciences Centre facilitated workshops and provided simulated sessions on personal protection principles for the management of a patient with EVD. This program was linked to the broader Ebola Virus Disease training strategy that aligns with the directives issued by the Chief Medical Officer of Health. We are proud to have played a role in developing the simulations and equipment used for these workshops. These workshops brought the hospital and pre-hospital (paramedic services) sides of the healthcare system together – believe it or not, this is something that doesn’t happen often. Through a series of hands-on activities and simulations, participants gained a better understanding of the principles around donning (putting on) and doffing (removing) PPE. HHF helped design a generalizable EVD doffing station based on our previous evaluations. 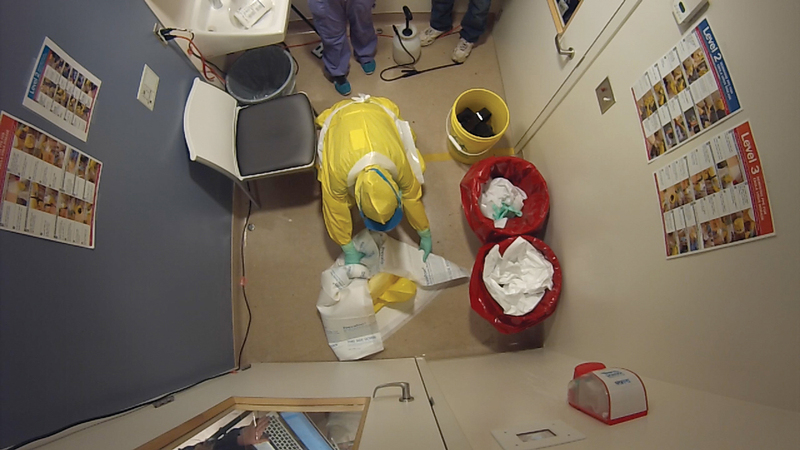 Doffing stations were included within a purpose-built EVD treatment room and a doffing room allowing us to test the concept of doffing stations and how the environment impacts the doffing process. This allowed us to simulate projectile vomiting and diarrhoea with the consistency of actual bodily fluids. A patient with EVD can output between 6-10 litres of fluid each day. To put things in perspective, the average human has approximately 5 litres of blood. Besides putting people off pudding, feedback from the event was extremely positive. Participants from all across Ontario left with a new appreciation of the environment and what it entails to treat a patient with projectile vomiting while wearing PPE.